This past week after work I’ve been working on a RF diplexer and filtering arrangement for a HAB Crossband repeater we’d like to fly on this coming weekend. So after a bit of simulating and gnashing of teeth I came up with the following arrangement. The Crossband repeater will RX on 2m and TX on 70cm using a single HT 2m/70cm antenna suspended under the payload. 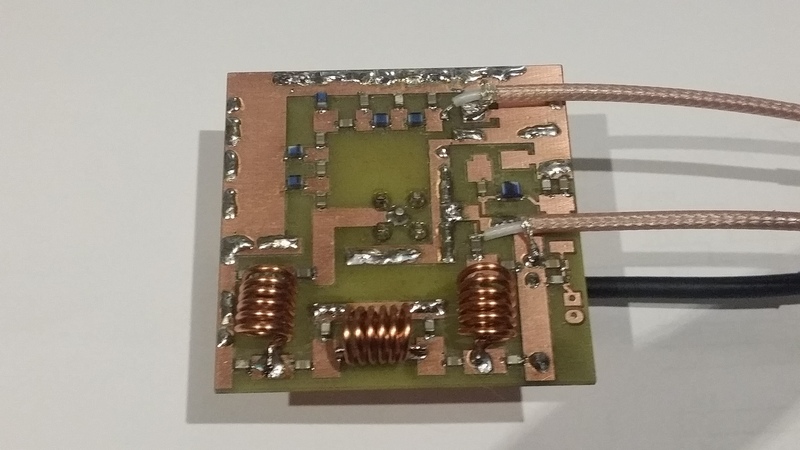 Being worried about interference from high power VHF services on the input to this repeater and high harmonic content on the transmitter I decided to use BPF arrangements. We’re only using Dorji modules on the repeater to keep the weight down, so too much RF at their front end would cause them to freak out a little when suspected 35km above the earth with a radio horizon of 800km or more in all directions. These modules are also known for having a fairly rich harmonic output on the TX. In the past I’ve build a few of the filters designed by Tasa YU1LM, so I’ve borrowed his high performance 2m BPF design, you can find the original article on this page (click). Tasa’s designs are excellent and easily reproducible, so many thanks to Tasa for sharing his knowledge ! The remaining circuits in the arrangement above are standard HPF, LPF and manufacturer reference designs which were optimised for various characteristics. Having completed the theoretical part it was time to build it. The board was quickly roughed out in a CAD package and thanks to Mark VK5QI a routed board produced as the first prototype. Routed boards require you to pick off the large expose sections of copper on the board, so 30 minutes with a scalpel under the microscope and I had a board that was looking the business. So then all that was left was to populate it, which is easier said than done. The worst part was the ground plane stitching which was done with a combination of 0.7mm TCW and 0.35mm wire-wrap wire. However I’m pleased with the result. Not too shabby. The Insertion loss is a little higher and the bandwidth a little wider than I had simulated, but all in all that is the beginnings of a quite reasonable 2m BPF. 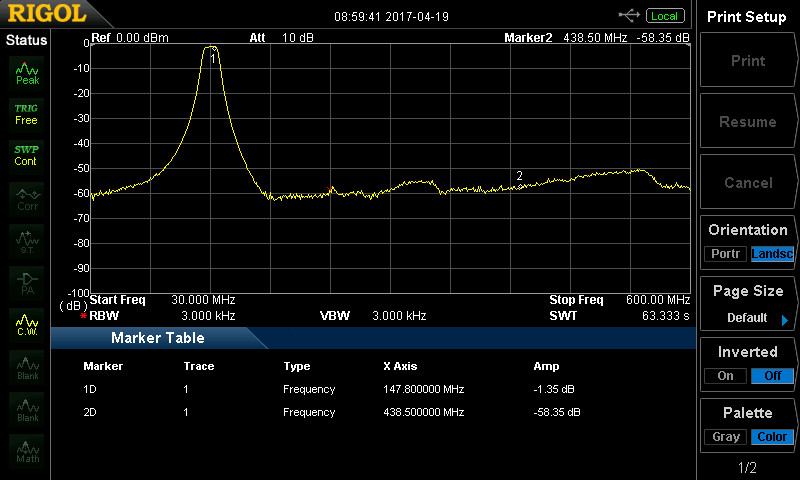 The two frequencies you can see in the marker table are the RX and TX frequencies of the cross band repeater respectively. 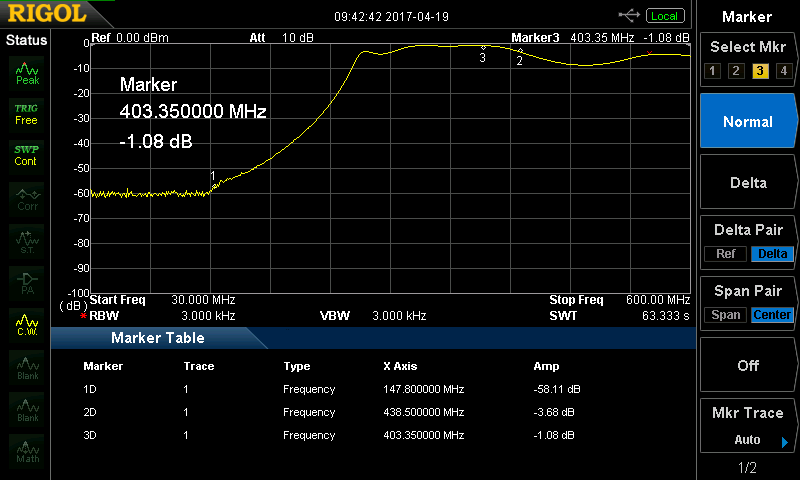 So the filter is giving a isolation between ports of greater than 55dB which should keep things going well. However looking at the 70cm port told a different story. 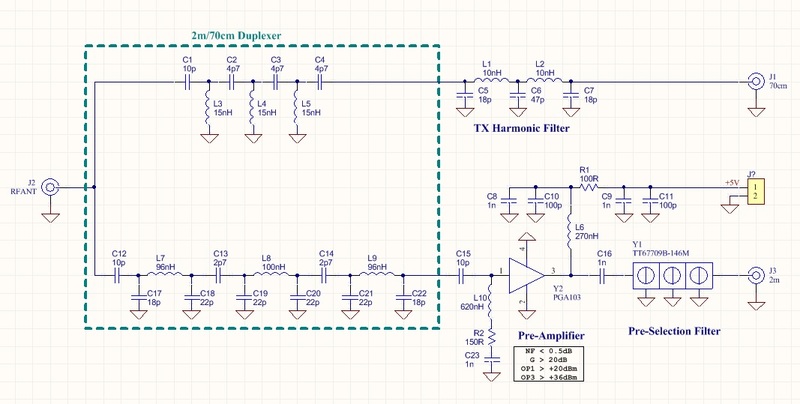 The TX harmonic filter had a terrible response with the cut off frequency below 400MHz, so that was killing any chance of the diplexer working satisfactorily. So I temporarily bypassed the harmonic filter so I could see what the 70cm HPF was doing, the plot of that is below. The insertion loss is still too high, but moving the cut off frequency 40MHz higher should restore the insertion loss figures I’m aiming for (<1.5dB), so I’ll pull out the simulations and see what i need to to change. Looking at the response it’s quite apparent that parasitic capacitance and inductance has crept into the design via the PCB, so with luck we can tweak this back to where we need to. I’m not lucky enough to have the tools that allow me to simulate the effect of the PCB design as well, sigh. Anyway we have the makings of a 2m/70cm HAB Crossband Repeater Diplexer, now if only i had another week in which to play with it and perfect the design (grin*), launch will be in two days time nothing like a bit of pressure. This entry was posted in HAB, Ham Radio by VK5ZM. Bookmark the permalink.